Graves and Goblins was published in Hawthorne's collection, The Dolliver Romance and Other Pieces (1876). "In life, I was a high-souled youth, meditative, yet seldom sad, full of chaste fancies, and stainless from all grosser sin. And now, in death, I bring no loathsome smell of the grave, nor ghostly terrors,—but gentle, and soothing, and sweetly pensive influences. Perhaps, just fluttering for the skies, my visit may hallow the wellsprings of thy thought, and make thee heavenly here on earth." “Alas, poor ghost!” will the reader say. Yet I am a happy ghost enough, and disposed to be contented with my grave, if the sexton will but let it be my own, and bring no other dead man to dispute my title. Earth has left few stains upon me, and it will be but a short time that I need haunt the place. It is good to die in early youth. Had I lived out threescore years and ten, or half of them, my spirit would have been so earth-incrusted, that centuries might not have purified it for a better home than the dark precincts of the grave. Meantime, there is good choice of company amongst us. From twilight till near sunrise, we are gliding to and fro, some in the graveyard, others miles away; and would we speak with any friend, we do but knock against his tombstone, and pronounce the name engraved on it: in an instant, there the shadow stands! Some are ghosts of considerable antiquity. There is an old man, hereabout; he never had a tombstone, and is often puzzled to distinguish his own grave; but hereabouts he haunts, and long is doomed to haunt. He was a miser in his lifetime, and buried a strong box of ill-gotten gold, almost fresh from the mint, in the coinage of William and Mary. Scarcely was it safe, when the sexton buried the old man and his secret with him. I could point out the place where the treasure lies; it was at the bottom of the miser’s garden; but a paved thoroughfare now passes beside the spot, and the cornerstone of a market-house presses right down upon it. Had the workmen dug six inches deeper, they would have found the hoard. Now thither must this poor old miser go, whether in starlight, moonshine, or pitch darkness, and brood above his worthless treasure, recalling all the petty crimes by which he gained it. Not a coin must he fail to reckon in his memory, nor forget a pennyworth of the sin that made up the sum, though his agony is such as if the pieces of gold, red-hot, were stamped into his naked soul. Often, while he is in torment there, he hears the steps of living men, who love the dross of earth as well as he did. May they never groan over their miserable wealth like him! Night after night, for above a hundred years, hath he done this penance, and still must he do it, till the iron box be brought to light, and each separate coin be cleansed by grateful tears of a widow or an orphan. My spirit sighs for his long vigil at the corner of the market-house! There are ghosts whom I tremble to meet, and cannot think of without a shudder. One has the guilt of blood upon him. The soul which he thrust untimely forth has long since been summoned from our gloomy graveyard, and dwells among the stars of heaven, too far and too high for even the recollection of mortal anguish to ascend thither. Not so the murderer’s ghost! It is his doom to spend all the hours of darkness in the spot which he stained with innocent blood, and to feel the hot stream—hot as when it first gushed upon his hand—incorporating itself with his spiritual substance. Thus his horrible crime is ever fresh within him. Two other wretches are condemned to walk arm in arm. They were guilty lovers in their lives, and still, in death, must wear the guise of love, though hatred and loathing have become their very nature and existence. The pollution of their mutual sin remains with them, and makes their souls sick continually. O, that I might forget all the dark shadows which haunt about these graves! This passing thought of them has left a stain, and will weigh me down among dust and sorrow, beyond the time that my own transgressions would have kept me here. There is one shade among us, whose high nature it is good to meditate upon. He lived a patriot, and is a patriot still. Posterity has forgotten him. The simple slab, of red freestone, that bore his name, was broken long ago, and is now covered by the gradual accumulation of the soil. A tuft of thistles is his only monument. This upright spirit came to his grave, after a lengthened life, with so little stain of earth, that he might, almost immediately, have trodden the pathway of the sky. But his strong love of country chained him down, to share its vicissitudes of weal or woe. With such deep yearning in his soul, he was unfit for heaven. That noblest virtue has the effect of sin, and keeps his pure and lofty spirit in a penance, which may not terminate till America be again a wilderness. Not that there is no joy for the dead patriot. Can he fail to experience it, while be contemplates the mighty and increasing power of the land, which be protected in its infancy? No; there is much to gladden him. But sometimes I dread to meet him, as he returns from the bedchambers of rulers and politicians, after diving into their secret motives, and searching out their aims. He looks round him with a stern and awful sadness, and vanishes into his neglected grave. Let nothing sordid or selfish defile your deeds or thoughts, ye great men of the day, lest ye grieve the noble dead. Few ghosts take such an endearing interest as this, even in their own private affairs. It made me rather sad, at first, to find how soon the flame of love expires amid the chill damps of the tomb; so much the sooner, the more fiercely it may have burned. Forget your dead mistress, youth! She has already forgotten you. Maiden, cease to weep for your buried lover! He will know nothing of your tears, nor value them if he did. Yet it were blasphemy to say that true love is other than immortal. It is an earthly passion, of which I speak, mingled with little that is spiritual, and must therefore perish with the perishing clay. When souls have loved, there is no falsehood or forgetfulness. Maternal affection, too, is strong as adamant. There are mothers here, among us, who might have been in heaven fifty years ago, if they could forbear to cherish earthly joy and sorrow, reflected from the bosoms of their children. Husbands and wives have a comfortable gift of oblivion, especially when secure of the faith of their living halves. Jealousy, it is true, will play the devil with a ghost, driving him to the bedside of secondary wedlock, there to scowl, unseen, and gibber inaudible remonstrances. Dead wives, however jealous in their lifetime, seldom feel this posthumous torment so acutely. Many, many things, that appear most important while we walk the busy street, lose all their interest the moment we are borne into the quiet graveyard which borders it. For my own part, my spirit had not become so mixed up with earthly existence, as to be now held in an unnatural combination, or tortured much with retrospective cares. I still love my parents and a younger sister, who remain among the living, and often grieve me by their patient sorrow for the dead. Each separate tear of theirs is an added weight upon my soul, and lengthens my stay among the graves. As to other matters, it exceedingly rejoices me, that my summons came before I had time to write a projected poem, which was highly imaginative in conception, and could not have failed to give me a triumphant rank in the choir of our native bards. Nothing is so much to be deprecated as posthumous renown. It keeps the immortal spirit from the proper bliss of his celestial state, and causes him to feed upon the impure breath of mortal man, till sometimes he forgets that there are starry realms above him. Few poets—infatuated that they are!—soar upward while the least whisper of their name is heard on earth. On Sabbath evenings, my sisters sit by the fireside, between our father and mother, and repeat some hymns of mine, which they have often heard from my own lips, ere the tremulous voice left them forever. Little do they think, those dear ones, that the dead stands listening in the glimmer of the firelight, and is almost gifted with a visible shape by the fond intensity of their remembrance. Now shall the reader know a grief of the poor ghost that speaks to him; a grief, but not a helpless one. Since I have dwelt among the graves, they bore the corpse of a young maiden hither, and laid her in the old ancestral vault, which is hollowed in the side of a grassy bank. It has a door of stone, with rusty iron hinges, and above it, a rude sculpture of the family arms, and inscriptions of all their names who have been buried there, including sire and son, mother and daughter, of an ancient colonial race. All of her lineage had gone before, and when the young maiden followed, the portal was closed forever. The night after her burial, when the other ghosts were flitting about their graves, forth came the pale virgin’s shadow, with the rest, but knew not whither to go, nor whom to haunt, so lonesome had she been on earth. She stood by the ancient sepulchre, looking upward to the bright stars, as if she would, even then, begin her flight. Her sadness made me sad. That night and the next, I stood near her, in the moonshine, but dared not speak, because she seemed purer than all the ghosts, and fitter to converse with angels than with men. But the third bright eve, still gazing upward to the glory of the heavens, she sighed, and said, “When will my mother come for me?” Her low, sweet voice emboldened me to speak, and she was kind and gentle, though so pure, and answered me again. 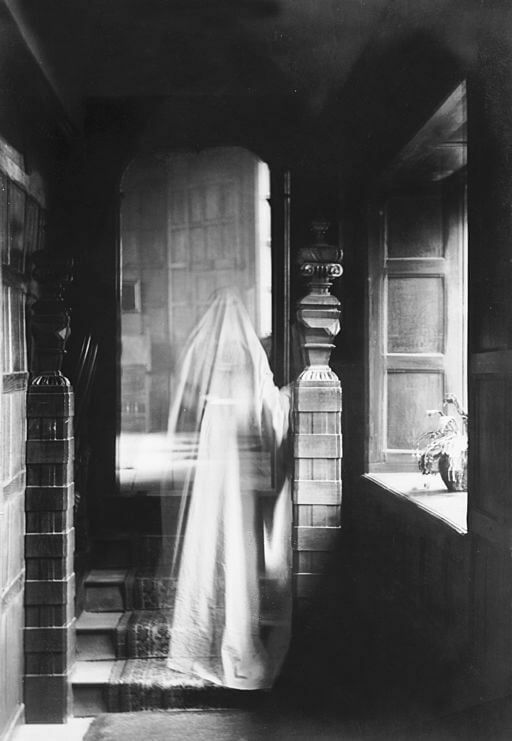 From that time, always at the ghostly hour, I sought the old tomb of her fathers, and either found her standing by the door, or knocked, and she appeared. Blessed creature, that she was; her chaste spirit hallowed mine, and imparted such a celestial buoyancy, that I longed to grasp her hand, and fly,—upward, aloft, aloft! I thought, too, that she only lingered here, till my earthlier soul should be purified for heaven. One night, when the stars threw down the light that shadows love, I stole forth to the accustomed spot, and knocked, with my airy fingers, at her door. She answered not. Again I knocked, and breathed her name. Where was she? At once, the truth fell on my miserable spirit, and crushed it to the earth, among dead men’s bones and mouldering dust, groaning in cold and desolate agony. Her penance was over! She had taken her trackless flight, and had found a home in the purest radiance of the upper stars, leaving me to knock at the stone portal of the darksome sepulchre. But I know—I know, that angels hurried her away, or surely she would have whispered ere she fled! She is gone! How could the grave imprison that unspotted one! But her pure, ethereal spirit will not quite forget me, nor soar too high in bliss, till I ascend to join her. Soon, soon be that hour! I am weary of the earth-damps; they burden me; they choke me! Already, I can float in the moonshine; the faint starlight will almost bear up my footsteps; the perfume of flowers, which grosser spirits love, is now too earthly a luxury for me. Grave! Grave! thou art not my home. I must flit a little longer in thy night gloom, and then be gone,—far from the dust of the living and the dead,—far from the corruption that is around me, but no more within! A few times, I have visited the chamber of one who walks, obscure and lonely, on his mortal pilgrimage. He will leave not many living friends, when he goes to join the dead, where his thoughts often stray, and he might better be. I steal into his sleep, and play my part among the figures of his dreams. I glide through the moonlight of his waking fancy, and whisper conceptions, which, with a strange thrill of fear, he writes down as his own. I stand beside him now, at midnight, telling these dreamy truths with a voice so dream-like, that he mistakes them for fictions of a brain too prone to such. Yet he glances behind him and shivers, while the lamp burns pale. Farewell, dreamer,—waking or sleeping! Your brightest dreams are fled; your mind grows too hard and cold for a spiritual guest to enter; you are earthly, too, and have all the sins of earth. The ghost will visit you no more. But where is the maiden, holy and pure, though wearing a form of clay, that would have me bend over her pillow at midnight, and leave a blessing there? With a silent invocation, let her summon me. Shrink not, maiden, when I come! In life, I was a high-souled youth, meditative, yet seldom sad, full of chaste fancies, and stainless from all grosser sin. And now, in death, I bring no loathsome smell of the grave, nor ghostly terrors,—but gentle, and soothing, and sweetly pensive influences. Perhaps, just fluttering for the skies, my visit may hallow the wellsprings of thy thought, and make thee heavenly here on earth. Then shall pure dreams and holy meditations bless thy life; nor thy sainted spirit linger round the grave, but seek the upper stars, and meet me there! Add Graves and Goblins to your own personal library.